Thank Morocco for giving you Argan oil, another miracle ingredient good for your skin and hair. Finally, the world has woken up to this ‘liquid gold’ which is loaded with endless anti-aging, hydrating and healing properties. Just because of these wonderful effects, Argan oil may be popping in your shampoos, facial masks and body butters too. What makes Argan oil amazing? Argan oil is extracted from the kernels found inside the fruit of the argan trees found in Morocco, Africa. It was extensively used in traditional medicine to treat various ailments related to skin such as acne, dry skin and wrinkles, but on discovery of other therapeutic values, the demand grew in western countries as well. Now, you can find the magical resource of argan oil everywhere, from shampoo bars to facials masks and instant eye-tightening serum. It has risen from just a natural, tribal ingredient to one of the most prized oils in the world. Distinguished as ‘liquid gold’, argan oil is extremely rich in skin friendly nutrients such as fatty acids and vitamin E.
You can use Argan oil as a skin moisturizer to hydrate and soften your skin. High in vitamin E and fatty acid content, few drops of this oil can give your skin a natural glow by getting absorbed easily in your skin cells. It’s widely known non-greasy and non-irritating properties make it an ideal natural moisturizer for all types of skins. All you have to do is to take few drops of argan oil in your palm and gently rub on your face and neck, just like any other body lotion. Worried about your aging skin? Wrinkles making you feel low? Use argan oil to regain that youthful glow and reduce the visibility of wrinkles from your skin. Its anti-oxidant effects may help you restore elasticity of your skin making you feel rejuvenated. For effective results, apply argan oil and massage it gently on your face and neck before going to sleep. In the morning wash it off. You may start getting a glow once again. If you suffer from dry skin conditions such as eczema then you may be able to get relief from your raw, flaky and itchy skin by applying argan oil. Due to the vitamin E and fatty acids present in this oil it can also repair your damaged skin. Not only this, it will help prevent further dryness, irritation and soothe your skin naturally. Apply few drops of oil directly to your affected skin and massage the area gently to encourage healing. Use of argan oil has been found to be helpful in treating mild acne. Since this oil is rich in linoleic acid, it helps promote healthy levels of sebum production. Moreover, this linoleic acid-rich oil helps prevent excess dead skin cells by promoting healthy skin turnover. Overall, you may soothe your afflicted skin by applying this non-greasy which would keep your skin balanced by providing natural moisture. It also reduces inflammation and heals damaged skin cells. Apply a few drops of argan oil on your skin afflicted by acne once you’ve cleansed and pat dried it. Rub this oil gently with your fingers. Repeat this application twice a day to keep your skin balanced and dry. Pregnant women may get a protection against stretch marks, sagging and wrinkled skin by using argan oil. As vitamin E-rich argan oil tends to increase the elasticity of skin, you can avoid developing those unpleasant stretch marks by rubbing few drops on stomach, breasts, bottom and thighs. Here’s more good news for you. You can also keep your locks revitalized by using this amazing liquid which is full of vitamin E, supposed to be promoting healthy hair growth. You may use argan oil as an ideal hair conditioning agent to make your hair softer, silkier and shinier. It can even help you treat split ends of your hair. There are other conditioners which are greasy and make hair stringy but argan oil would absorb easily without leaving any greasy residue. Just take a few drops of argan oil in your palm. Rub it thoroughly. Comb your fingers to apply this oil on your towel-dried hair. Make sure you massage your scalp well for better results. This will make your scalp healthy and encourage hair growth as well. In hurry, when you need to style your hair, argan oil may be of great help. Without any harmful chemicals this natural organic oil would give an immediate gloss to your hair. Not only this, it may provide you a great way to tame your frizzy hair instantly. You may also use it before straightening because argan oil may help prevent your locks against heat damage. Take a few drops of argan oil in your palm and comb through your dry hair. Make sure you apply it evenly all over your hair. It will act as a great styling agent to manage your hair. Before a special event you can treat your hair with plenty of argan oil(as a hair mask) to make them extra smooth, sleek and voluminous. This overnight treatment is a great way to nourish your hair with vital nutrients found in this oil. The procedure is very simple. Take plenty of argan oil in your palm and massage it into your scalp, hair and tips. Wrap your hair with a towel and leave this treatment for a night. In the morning, wash your hair with your regular shampoo to get sensationally soft and silky hair. 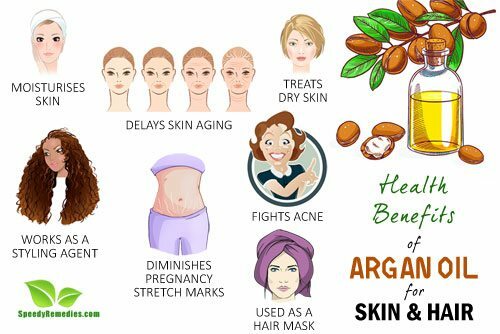 So these were some amazing health benefits of argan oil for your skin and hair. But the best thing with this oil is that you can safely use it in its pure form. There is no need to buy it as an ingredient in lotions, moisturizers and conditioners. Just one bottle of versatile argan oil is enough to bring a positive change in the way you live your life.